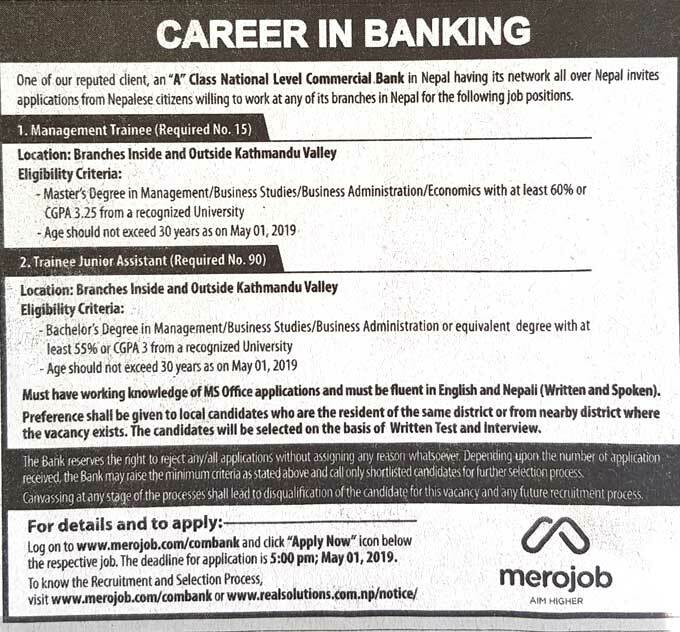 An “A” Class National Level Commercial Bank in Nepal having its network all over Nepal invites applications from Nepalese citizens willing to work at any of its branches in Nepal for the following job positions. > Master’s Degree in Management/Business Studies/Business Administration/Economics with at least 60% or CGPA 3.25 from a recognized University. > Candidate’s should be computer literate and must be fluent in written and spoken English and Nepali. > Age should not exceed 30 years as on May 01, 2019. Must have working knowledge of MS Office applications and must be fluent in English and Nepali (written and spoken). Preference shall be given to local candidates who is the resident of the same district or from nearby district where the vacancy exists. The candidates will be selected on the basis of written test and interview. Canvassing at any stage of the processes shall lead to disqualification of the candidate for this vacancy and any future recruitment process. No telephone inquiries will be entertained. The deadline for application is 5:00 pm, May 1, 2019. Log on to [ LINK HERE ] and click "APPLY NOW" icon below the respective job.